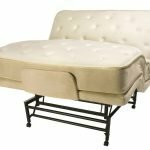 The Hi-Low Flex-A-Bed Electric Adjustable Bed is the ideal bed for those who want an electric adjustable bed that can be raised and lowered vertically as well as adjusted to various sleeping positions at the touch of a button. The Hi-Low Flex-A-Bed Electric Adjustable Bed is the ideal bed for those who want an electric adjustable bed that can be raised and lowered vertically as well as adjusted to various sleeping positions at the touch of a button. 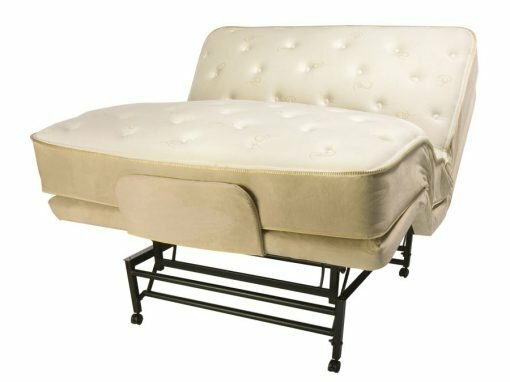 Our adjustable electric bed looks like a luxurious conventional bed! Individuals who are healthy and lead active lives as well as those who suffer from injury, pain, or chronic conditions, enjoy the ease of operation, height adjustment capabilities, various sleep positions available, and achieve the perfect night’s sleep. The Linak motors, one for height adjustment and two for head and foot operation, are whisper-quiet. And the height, head and foot position electric bed adjustability is controlled with a one-touch, wired or wireless, hand control. 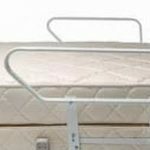 The Hi-Low Flex-A-Bed electric adjustable bed frame is manufactured using high-grade welded steel. The padded base will not break, squeak or warp and is covered with Advantech material. Locking casters prevent the bed from moving during bed adjustments. The standard 26-inch height of the adjustable electric bed raises to 33-inches, and by removing the casters, the height can be lowered and adjusted from 24-inches to 31-inches. Our Hi-Low Flex-A-Bed Electric Adjustable Bed comes with a traditional innerspring mattress; however, other mattresses are available for an additional charge. The innerspring mattress is available in soft, medium and firm. The mattress has a multi-layered, quilted cushion top made with high-density polyurethane foam and flame-resistant polyester fiber. The bottom layer is made with non-skid materials that prevent the mattress from sliding across the adjustable bed foundation and provide a flame-resistant barrier between the base and the mattress. The innerspring unit is inner-bonded to insure durability, maximum support, and comfort. Our newest model of the Hi-Low Electric Adjustable Flex-A-Bed can be equipped with optional dual-timed massage for an additional charge, which operates in constant, wave, and pulse modes. The speed and intensity of massage can be controlled. Optional side rails can be attached to the Hi-Low Flex-A-Bed Adjustable Electric Bed, assist with getting in and out of bed, and provide added security during sleep. NOTE: The Flex-A-Bed electric adjustable bed should not be considered as an alternative to a hospital bed. A physician should be consulted when health issues are involved as to the appropriateness of an adjustable bed. The Visco core is laminated to the polyurethane foam to create a solid core. Our mattresses and bases meet the CPSC 16 CFR Part1633 Standards for Flammability (open flame) of Mattresses and Foundations.